If you encounter any problems while on our website, we would appreciate if you would let us know. Click on our Logo to return to our home page. [Ctrl] [+] - Hold down the control [Ctrl] key and press the plus [+] key. [Ctrl] [-] - Hold down the control [Ctrl] key and press the plus [-] key. [Ctrl]  (zero) - hold down the control key [Ctrl] and press the  (zero) key. (Note the shortcuts above should work on all websites if your browser is internet explorer - many other Windows based browsers use the same shortcuts. to (EXCEPT IN THE CHECKOUT PROCESS - In the Checkout use the buttons at the bottom of the page to return to the shopping cart. On the top portion of the left-hand menu are categories. The lower section includes brands that are well known in the gift field. At the bottom of the main item page we provide links to the pages/categories the item is listed under. We also try to provide a few similar items. Use the category links to view entire selections of similar items. (You may also use your internet browser back button to go back one page). close the window. Always use your internet browser back button to return to the item page. Except some oversized items which ship in the manufacture's box, all item are packaged safely inside a exterior shipping box with packing materials appropriate for the item. GLASS - If the manufacturer did not provide an individual box, we place most glass ornaments in a specialty or white Gift Box . NON-GLASS - Depending on how fragile the item is, we will either package the item in a Gift Box or bubble wrap. Weights do not include the exterior shipping box nor packing materials used to cushion your items. We take our own pictures as quickly as we can so you see what the ornament actually looks like. Our pictures will normally provide more than 1 view (usually a second view on the item page). We may temporarily use the pictures provided by the manufacturer which vary in accuracy. If there is more than 1 view on the item page, then we have taken our own picture of the item. If major parts of the item have a shiny-reflective finish we try to state that on the item description. Those areas often become lighter or darker depending on your personal lighting in the room (may appear bright red in direct sunlight and as dark red at night on a tree with only tree lights). We only touch up photos to more accurately depict the item. Sometime lighting/camera glare will give the appearance of a defect when there is not one. In those instances we touch up the photo. On some colors, as purple, camera's do not always depict the correct color, in those cases we adjust the color of the original photo to better depict the actual color. Weights are listed after the size details on the item page. Weights are for the item only. Generally accurate to 1/10th of an ounce (0.1 ounce). Packaged Weight: If we provide the "packaged weight" it includes the manufacturers packaging but NOT the final shipping weight with the exterior shipping box and packing materials. FINAL SHIPPING WEIGHTS vary depending on what was ordered. Often the shipping box & packing materials make up the majority of the final shipping weight. Example: A glass ornament weighing 1 ounce may have a final shipping weight of 12-13 full ounces due to packaging. We may temporarily use the manufacturers sizes, which are sometimes inaccurate.If we have provided a weight, we have made our own measurements. 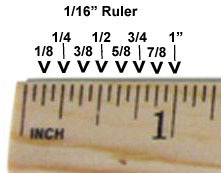 Our Measurements are approximate within 1/8 of an inch. Excluded in measurements: Ornaments with a round hanger wire at top DO NOT include the round wire portion in the size - typically allow up to 1/4" for the round hanger wire.